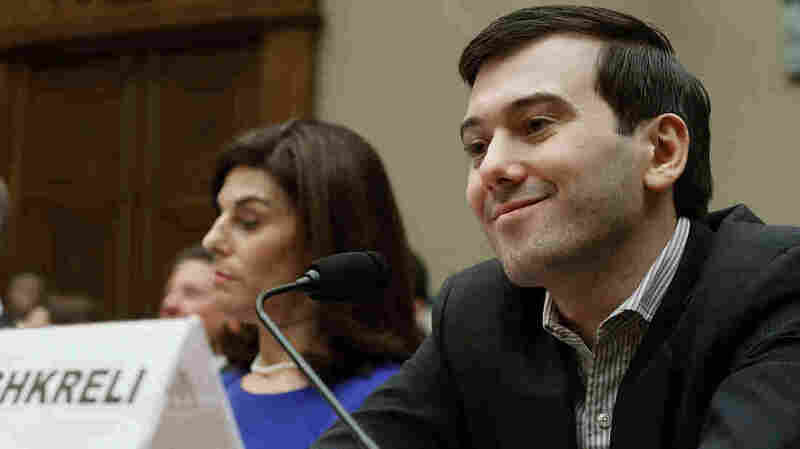 Martin Shkreli Grins, Has No Comment At Hearing On Drug Prices : The Two-Way The much-reviled former pharmaceutical executive remained tight-lipped, pleading the Fifth Amendment on his lawyer's advice. He simply smiled in response to harsh criticism from House representatives. Martin Shkreli, former CEO of Turing Pharmaceuticals, smiles beside Nancy Retzlaff, Turing's chief commercial officer, during a House Oversight and Government Reform Committee hearing on Capitol Hill on Thursday. Martin Shkreli, the former pharmaceutical executive who inspired wrath when he raised the price of a life-saving drug by 5,000 percent, appeared before the House Oversight and Government Reform Committee on Thursday for a hearing on prescription drug prices. But his testimony was far from fruitful. You may remember that Shkreli, the founder and former CEO of Turing Pharmaceuticals, became infamous last year. His company bought the rights to the drug Daraprim, which treats a deadly parasitic infection, and raised the price from $13 a pill to $750 a pill. The company later backed off that increase, but Shkreli defended the decision as simply a good business decision. Separately, he's been arrested for fraud over a hedge fund he managed from 2009 to 2014. In December, he resigned as Turing's chief executive. Shkreli appeared before the House committee on Thursday to discuss drug pricing. The hearing also featured testimony from Dr. Janet Woodcock and Keith Flanagan of the FDA, Howard Schiller of Valeant Pharmaceuticals (which also has been criticized over its price hikes), Nancy Retzlaff of Turing and Mark Merritt of the Pharmaceutical Care Management Association. In Turing's defense, Retzlaff said that two-thirds of patients receive Daraprim at a steep discount through government programs, and that the company funds an assistance program for uninsured, low-income patients. Shkreli was much more tight-lipped. His lawyer had advised him to plead the Fifth. And Shkreli followed that advice to the letter. Rep. Jason Chaffetz, chairman of the committee: "What do you say to that single pregnant woman who might have AIDS, no income, she needs Daraprim in order to survive. What do you say to her when she has to make that choice? What do you say to her?" Chaffetz: "Do you think you've done anything wrong?" Shkreli: "On the advice of counsel," (pausing for a moment) "I invoke my Fifth Amendment privilege against self-incrimination and respectfully decline to answer your question." Shkreli isn't usually so reticent. He has been outspoken and unapologetic in his conversations with reporters — and his live video streams from his apartment. In fact, his new lawyer has said he agreed to represent Shkreli on one condition: The 32-year-old had to stop granting interviews with the press. A visibly frustrated Rep. Trey Gowdy pointed out that Shkreli could answer a wide range of questions without incriminating himself. "I intend to follow the advice of my counsel, not yours," the former pharmaceutical executive said with a tight smile. "Well, Mr. Chairman, I am vexed," Gowdy said, pointing to Shkreli's readiness to talk to the press, but not to Congress. Rep. Elijah Cummings, for his part, didn't even attempt to question Shkreli, and instead pleaded with him — arguing that Shkreli could use his position, and his influence over his former company, as a force for good. Cummings said Shkreli could use his influence to advocate for patients' rights and could "make a difference in so many people's lives." "I know you're smiling," Cummings said, "But I'm very serious, sir. The way I see it, you can go down in history as the poster boy for greedy drug company executives, or you could change the system. An earlier version of this post misspelled the last name of Turing Pharmaceuticals executive Nancy Retzlaff as Retzclaff.